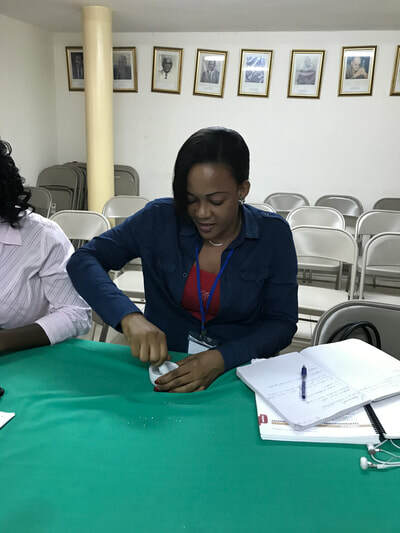 HWB's Fundamentals Course is moving ahead in our goal to strengthen Haiti's capacity to meet the healthcare needs of it people by integrating the use of homeopathic medicines. Thirteen doctors, nurses and a social worker are participating in the Fundamentals Course in Port au Prince, Haiti. 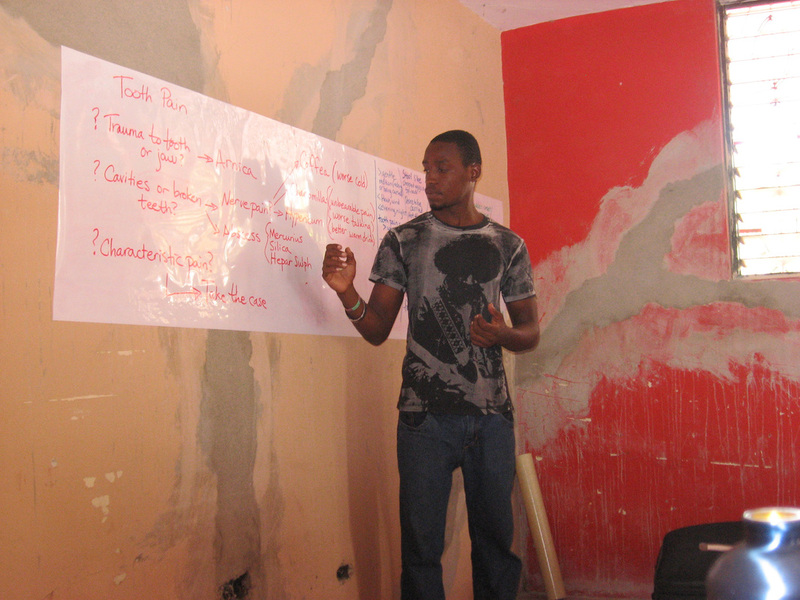 This course is being held in collaboration with the Haitian Medical Association where classes are being held. Each session is comprised of two full days of classroom learning followed by three days of clinic work. All of this is under the expert teaching of Lauren Fox, FNP-BC, CCH with assistance from Homéopathe Communautaire, Mhaidjiv Legerme who also serves as translator; pharmacist and Homéopathe Communautiare, James Alcy, who manages the dispensary; and HWB volunteer professional homeopaths who work to guide students in honing their casetaking skills in community clinics. 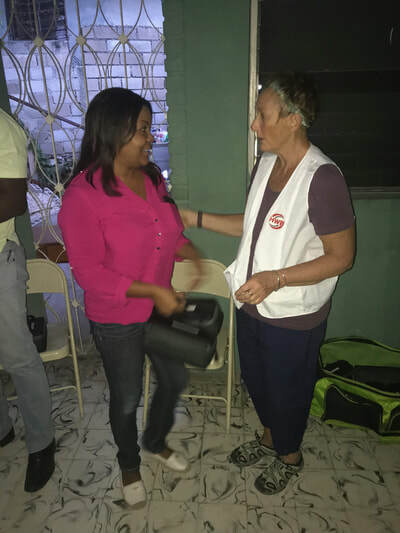 At the close of the second session in November 2017, students received their own homeopathic medicine kits thanks to the generosity of Hahnemann Labs. Students are encouraged to work in groups in their communities and will have the opportunity of working via telemedicine with Lauren. 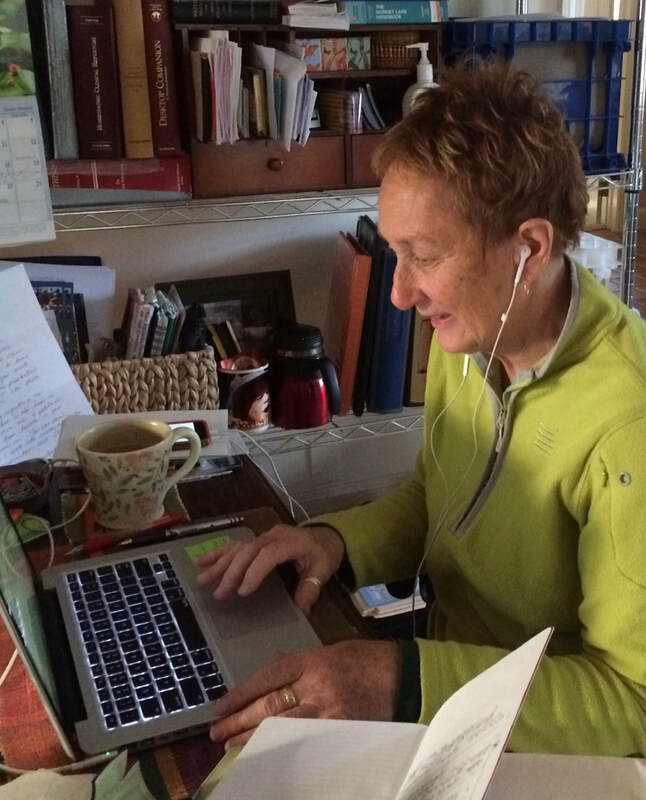 ​ In June 2017, the Essential Curriculum for Learning Homeopathy went to the printers. 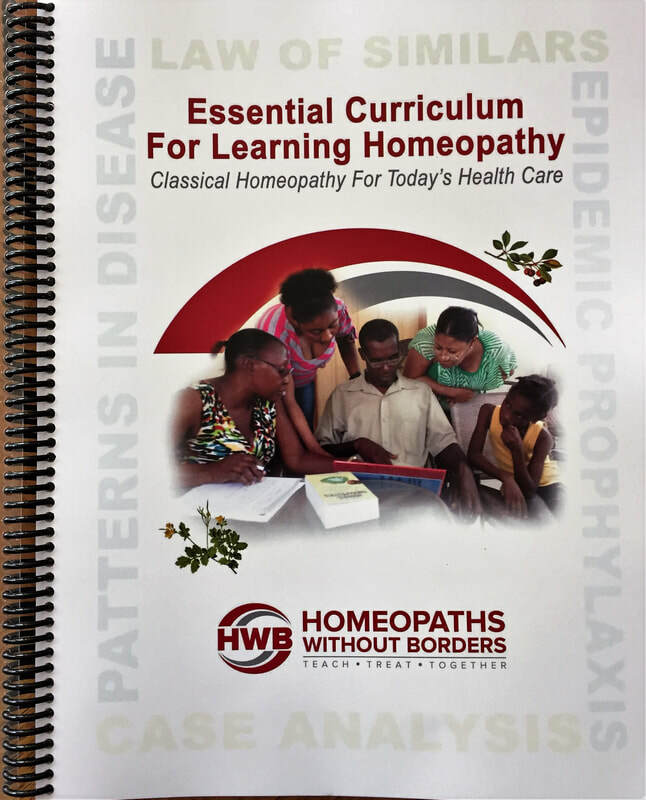 The Curriculum is the outgrowth of the Fundamentals of Homeopathy course which was developed by HWB for teaching Homéopathes Communautaires and health care practitioners in Haiti. The book has been published in English and French. 250 pages long, it includes 22 lessons, Therapeutic Reference Charts for a number of acute ailments, Epidemic Reference Charts, and Materia Medica Diagrams for 45 homeopathic medicines. It is suitable for study groups, schools and individuals wishing to learn the Fundamentals of Homeopathy and is already being used by Baylight School of Homeopathy in Maine. ​ Click here to purchase or learn more. Early accolades for the Essential Curriculum for Learning Homeopathy! "An excellent way to learn homeopathy, especially suitable to developing countries. It keeps homeopathic concepts clear, user-friendly and simple!" Jeremy Sherr, Founder, Dynamis School. Homeopathy for Health in Africa. "This field manual is a wonderful compendium of a vast amount of information. With clear, no-nonsense language and layout, it guides you through the basics of homeopathic philosophy, how to take a case, how to treat common ailments, how to deal with acutes and epidemics." "I am truly impressed with this manual. I'm just finishing up a distance learning Acute Care course in Homeopathy, and I wish I had found your manual first. It is well laid out and well structured. This program is an essential curriculum in homeopathic therapeutics for doctors, nurses, midwives, pharmacists, healthcare workers and community leaders. 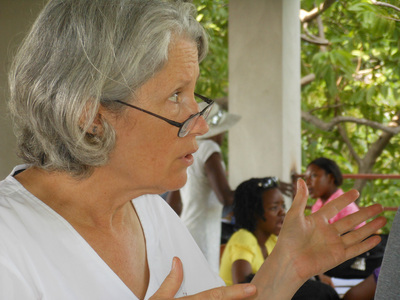 The program, developed by Karen Allen, CCH, includes theoretical education and clinical training and comprises 48 hours of lecture with a minimum of 42 hours of clinical training. Course participants learn principles, methodologies and procedures of homeopathic care. The focus of the therapeutic training is for acute, traumatic and epidemic diseases common to the host communities where we partner. Students who successfully complete the course earn Homeopathe Communautaire (Community Homeopath) status and may work independently, collaboratively in a clinic or within a multidisciplinary healthcare team to provide safe, sensitive, ethical care. This course is taught by HWB trained educators with active and committed support from homeopathic doctors, nurses, midwives and practitioners who provide clinical training and mentoring during clinical training. It is a fundamental goal of this project to develop self-sufficiency with healthcare for the host community. In April 2012, HWB initiated the first in a 5-part training in Homeopathy Fundamentals in Port-au-Prince. Learn more. 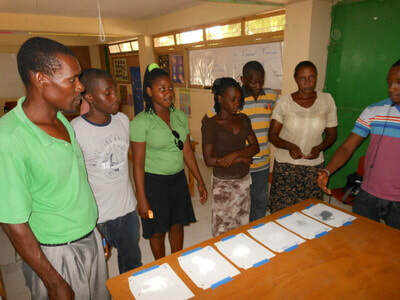 In June 2012, Haitian homeopathic students worked with HWB volunteers in clinic. Learn more.